When you can’t get a straight shot at a fastener with an Allen wrench, sometimes you can use a ball-end wrench — but you’re more likely to strip the head since less of the wrench makes contact. With its pivoting hinge, a Hex-Pro key wrench can reach those fasteners while still fully engaging the fastener head. Hex-Pro key wrenches are manufactured from high-quality industrial steel, and they’re chrome-finished for corrosion resistance. The long handles provide good leverage while the heads swivel 180° to reach into tight locations. 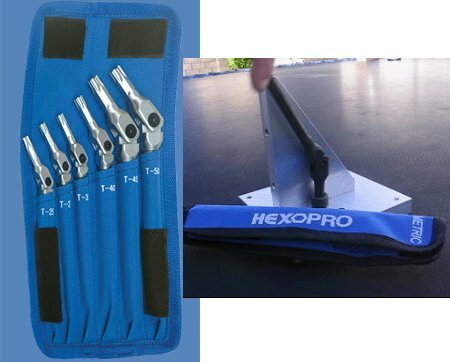 You’ll find Hex-Pro wrenches sold as five-piece SAE sets, six-piece metric sets, six-piece star-drive sets, or individual wrenches. The kits come with a folding canvas tool roll and run about $35 to $40. Individual wrenches cost $5 to $8 apiece. I keep typing in several paragraphs of comments (three times now), but the browser keeps reloading the page, erasing all my words. So forgive me, but I’m tired and going to offer my comments as concisely as possible. Sears has Gearwrench wrench sets discounted by 30% this week. Metric or SAE set = $30-$9 + $6.25 = $27.24 shipped (not including tax); Torx set is $30.75 shipped w/o tax, all three sets for $80 regularly – but I can’t find the link right now meaning it could be unavailable. Sorry again for the choppy grammar, but the page reloaded five more times (as expected) and I was too frustrated to type like a normal person. At least this time I learned to copy and paste as I went along.